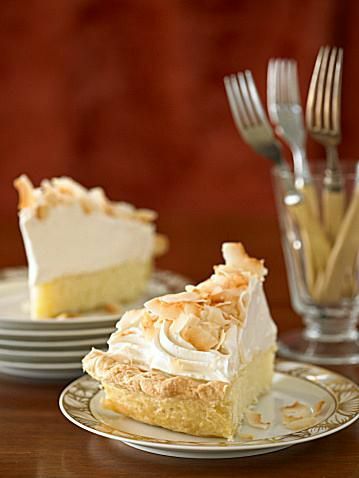 Coconut filling is cooked on stovetop then poured into the baked crust and chilled with a whipped cream topping. Combine cornstarch, sugar and salt; mix well. Gradually stir scalded milk into cornstarch mixture. Bring to a boil, stirring constantly, and boil for two minutes, or until thickened and shiny. Add a small amount of the hot mixture to eggs and beat until well blended. Return to pan and beat for two minutes over medium heat until slightly thickened, being careful not to let mixture curdle. Remove from heat and add vanilla and margarine, mixing until smooth. Pour through sieve to strain out lumps. Place plastic wrap directly over filling; set aside to cool. Add coconut extract and half the coconut to the cooled pie filling. Pour filling into pie shell; chill. Spread whipped cream over pie, mounding in center. Sprinkle with remaining coconut. Coconut cream pie recipe makes one 10-inch pie.